Grand Champions!! Forest Grove Middle School Chorus earned a Superior Rating for 1st Place Treble Chorus and overall Grand Champion for Vocal Performance at the Music USA Festival in Orlando! Bulldog Band scored a SUPERIOR and placed second at the Music USA Festival!!! We are very proud of this great performance!! Our MOA 6th graders had an awesome day getting their feet wet and searching the skies for birds that frequent our local ecosystem. Their findings help them to better understand our local waterways and how the animals coexist in the habitat. Our future environmentalists are hard at work! Way to go Bulldogs! 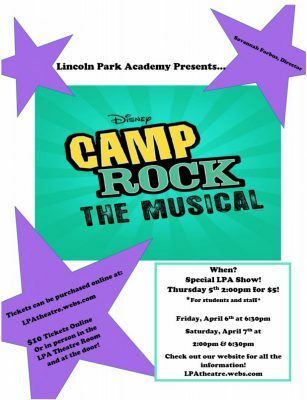 Get your tickets now for Camp Rock The Musical! Lincoln Park Academy presents this musical for all audiences on Friday, April 6th at 6:30pm and Saturday, April 7th at 2:00pm & 6:30pm.